Pompoko’s reputation amongst Brighton locals, for fast, yummy and incredibly good value grub, means there is hardly ever a quiet moment. Whether you’re there to eat in or grab a takeout, Pompoko Brighton can deliver up simple Japanese classics to a range of different tastes. 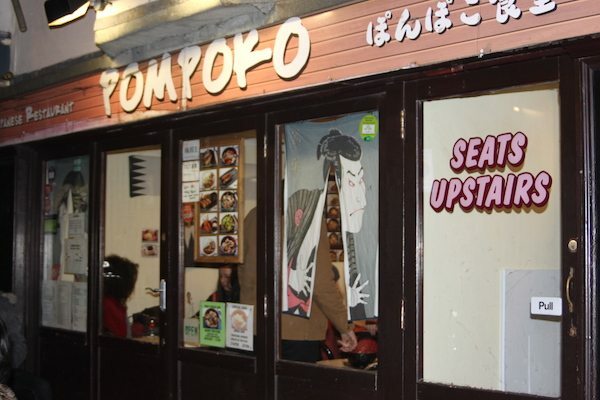 Pompoko is not an intimate dining experience, and be prepared to sit very close to other diners to get a seat quickly. Despite the constant flow of diners you are always greeted with a smile and the service is good and incredibly well organised. 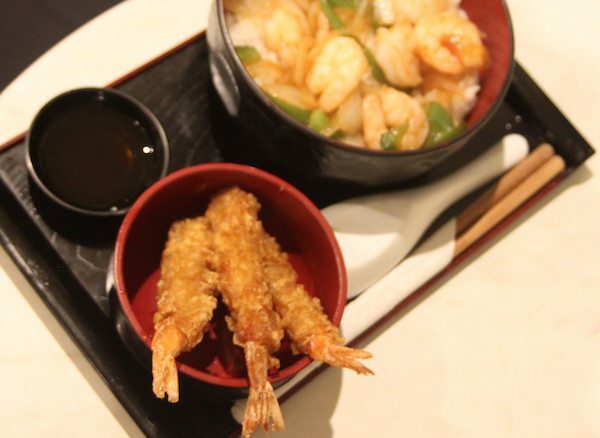 Pompoko really is fast food – the really good kind, not the guilt ridden kind! 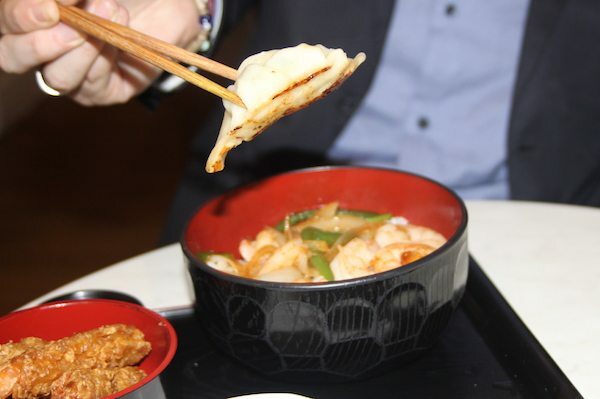 Everything comes together on Japanese trays, with the rice bowl on one side and the starters on the other, along with dipping sauces for the starters. The folks at Pompoko keep things simple, ensuring your meal can be served quickly, without compromising on the quality. The menu consists of 10 small appetiser dishes, traditional Japanese Curry, six staple Donburi dishes, Yakisoba noodle dishes, Yakimeshi rice dishes, and for a lighter bite, salad bowls. All mains are served with a choice of meat, fish or veg. Pompoko is one of the many Brighton BYO (bring your own) establishments. Many diners take advantage of this invite, happily paying the small corkage cost to drink their wine of choice with dinner. Pompoko do not actually sell their own alcohol, although they do have a good range of soft drinks and teas including Mugi Cha – a Japanese tea that you can have hot or cold. There is no table service at Pompoko, you go to the counter on the ground floor to place your order. It can get very busy down there, with people coming in to collect their takeaway, people waiting for a table, or people just queuing to order their food. It is not surprising that most people seem to prefer the upstairs room, away from the bustle; if you are looking for a more intimate dining experience, it might be better to hold out for a table up there. We think the pace of Pompoko adds to its charm; it is what it is – in their own words, Pompoko ‘is a cross between a restaurant, café, and a takeaway’ – and it works very well. The service runs like clockwork, but always with a smile the food is simple but simply yummy; the atmosphere is relaxed, but always buzzing. Pompoko mostly serves as a quick cheap fuel stop when out for an evening in Brighton, it’s a no-frills gem as the food is plentiful and very tasty. Always busy but don’t let that deter you, it’s fast turn over so you’ll get a seat in no time. Cash only.